This story from Northwest Georgia News seems to be important in documenting Civil Air Patrol and the U.S. Congress. CASSVILLE, GA – Local Civil Air Patrol (CAP) member, Cadet Captain Christiana Loudermilk, daughter of State Rep. Barry Loudermilk, was recently asked to represent the Cadets of the Georgia Wing CAP at Congressional meetings in Washington D.C.
Georgia Wing Commander, Colonel Jay Hughes, requested Loudermilk to join him in meetings with members of the U.S. Senate and U.S. Congress during the annual CAP Winter Board meetings in the nation’s capitol. Hughes selected Loudermilk because he felt her professionalism and individual accomplishments portray a positive example of the CAP cadet program. It was a true honor to represent the almost 800 cadets in the State of Georgia at our Nation’s Capitol”. Said Loudermilk. “It was a tremendous opportunity to do something to help the Civil Air Patrol and my fellow CAP members, and I will never forget this experience. 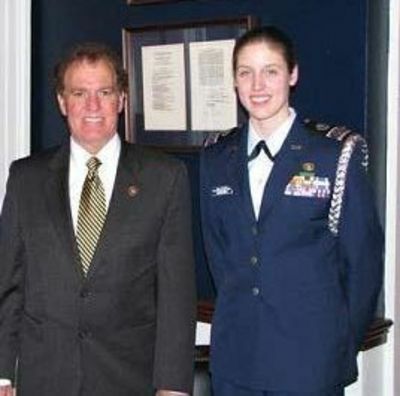 Be the first to comment on "Georgia CAP Cadet Sees Inside Congress"